Teak Furniture Outlet offers this teak table perfect for sitting high and gazing out over a fabulous balcony view. Pair this teak table with two of our teak bar stools to make a great set! Atlanta Teak's teak furniture comes with a "Guaranteed" satisfaction or ship it back! 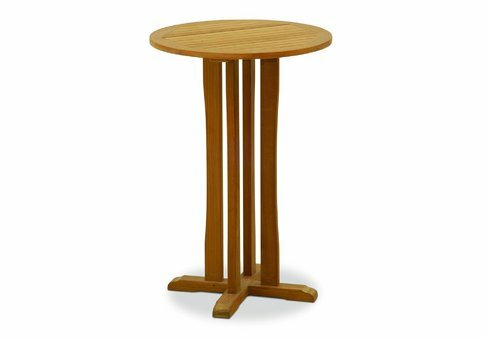 Teak Furniture Outlet stands behind Atlanta Teak's product quality, customer service, and return policy that is second to none in the teak industry. Our high quality teak and excellent kiln-drying process make us an easy choice over any Indonesian teak furniture manufacturers. Teak Furniture has a life expectancy of 75+ years, untreated and weathered. Teak Furniture Outlet offers teak furniture made of excellent workmanship, smooth finish and uniformity in color and grade. Our teak furniture is so well crafted, many of our commercial and residential customers have been known to use our teak sets indoors with its natural finish. Please contact us today with any questions you may have. We look forward to exceeding your expectations!